A view from the stairs of the National Museum across the Centre of Beijing's Tian an Men Square. Across lie the Monument to the Heroes of the Revolution and the Great Hall of the Peoples, China's "Peoples Democratic" Parliament. 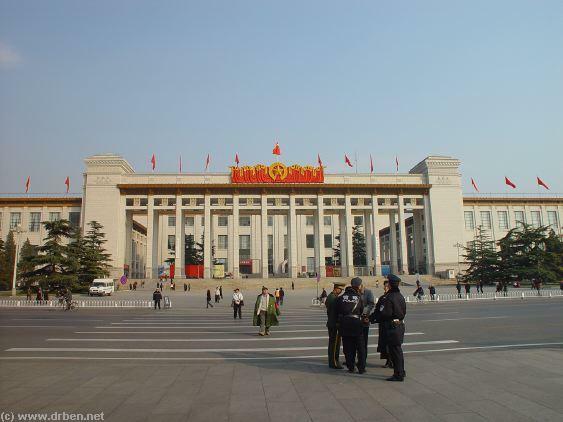 The National Museum covers the main portion of the Eastern Flank of Beijing's world-famous Square of Heavenly Peace, the largest Square in the World Today. The Museum Building was constructed in the 1950's as one of the main elements of the immense Architectural Monument honoring the Chinese Revolution and the success of the "New China", The Peoples Republic, that the Square of Heavenly Peace is. The National Museum is easy to locate. 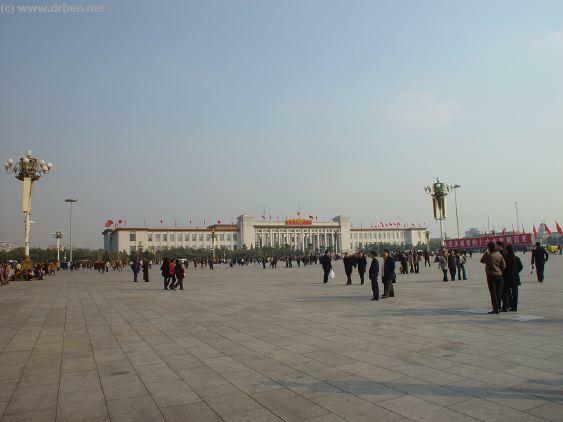 The Museum fills most of the Eastern Flank of Beijing's world-famous TianAnMen Square, the Square of Heavenly Peace. The Square of Heavenly Peace is found in the very center of the City, and is located due South of the Palace Museum (Forbidden City), the Southern-most Gate of which, The Gate of Heavenly Peace stands at the North Side of the giant Square. Beijing City Police Officers and Armed Police Guards checking the identity papers and sometimes hand-luggage of Chinese Vistors to TiananMen Square in an effort to prevent Public Protests on the Nations Number one Square (Photo May 2005 AD). 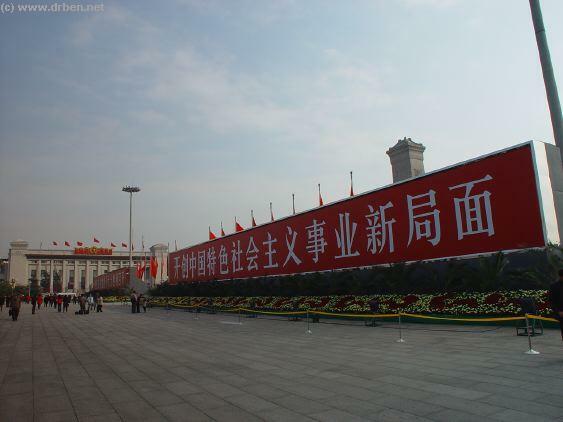 Political Slogans fill Tian An Men Square during the 16Th Edition of the Communist Party of China National Congress in November 2004 AD. The Slogan Reads: Contribute to a Better Society, etc. 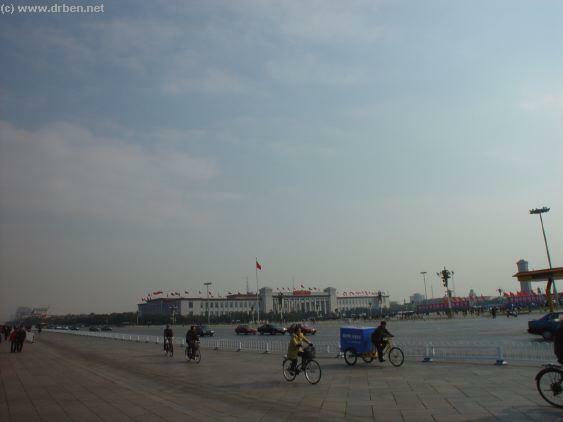 Panoramic View of Tian An Men Square and the National Museum as seen from the stairs of the Great Hall of the Peoples during a sunny day in November 2005 AD. Note the Olympic Countdown display in front of the National Museum. 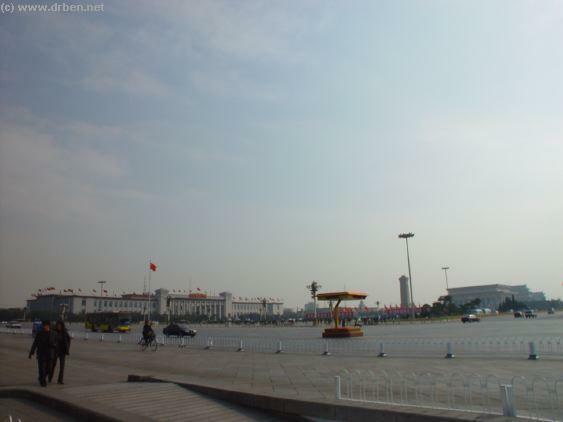 China's National Museum, East Chang An Avenue and TiananMen Square as seen from in front of the Tian An Men - Gate of Heavenly Peace (2004 AD). The collossal and Impressive Front of the National Museum, part of the Grandiose Architecture of China's Revolutionary TiananMen Square. The National Museum and Monuments of TiananMen Square seen from the North side of the Square (Photo November 2002 AD). The original National Museum was established at the Site of the former Imperial College of the Ming and Qing dynasties in 1912 AD. This building later expanded northwards to include space North above the south gate of the Imperial City and associated spaces. It opened to the public in 1926 AD. A completely new Building was constructed immediatly after the founding of China's New State in 1949 AD. Exhibitions range the entire history of China, from it's Ancient History to it's Modern History as well as Contemporary Subjects of Culture. Naturally there still is a section devoted to the Communist Revolution and Mao Zedong. Satellite Image Map of TiananMen Square - Square of Heavenly Peace with links to sites, monuments and streets on and around the Square. Culture and West of the Nanchizi Dajie' and Dong Chang An Jie' (East Eternal Peace Avenue) intersection. Another option is the new Subway Station at West Chang An Avenue, directly in front (North of) the New National Theatre, aka Beijing's Silver Dome. From there it is a considerable but pleasant and interesting walk past the Great Hall of the Peoples and across the Square of Heavenly Peace to the National Museum. Please Note: the National Museum cannot be reached directly by Taxi/Cab, as the entire Square of Heavenly Peace is a special secure area and no stops or Parking are allowed at or immediate around the Large Square. In this case take a Taxi to the Grand Hotel Beijing (at East Eternal Peace Avenue) or opt for a stop near QianMen at the very South End of the Square. Those who need or would like to shorten their walking distance even further can take a rickshaw across the pedestrian side-walk and arrive in style at the stairs to the Museum. Naturally, the Museum has a ramp to provide access for wheel-chair bound persons. Bus Lines do not connect directly to TiananMen Square nor stop at the Square. The Easiest Bus Route would be to take a Bus along Dong Chang An (East Eternal Peace) Avenue in the direction of the Square. Last but not least one could drive oneself taking a (Rental) car and the route along East Eternal Peace Avenue, however one is not allowed to stop or drop of passengers at TiananMen Square or in it's immediate vicinity and no parking spaces are available anywhere near the National Museum. Any visit includes a walk to The Museum. History. 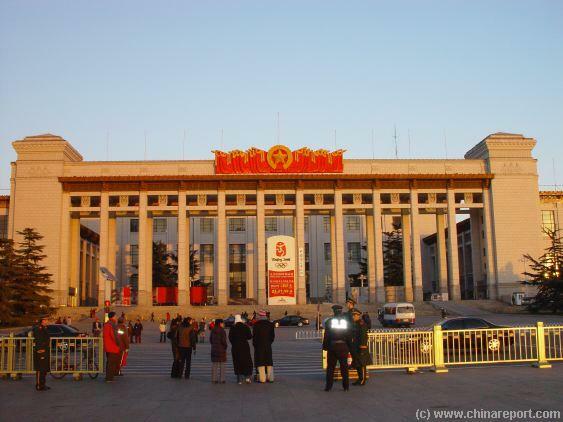 In Februari of the Year 2003 AD, after a long period of closure, the gargantuan Museum Building was reopened after a complete reorganization as the National Museum of China. Today the National Museum is active in the field of archeolical discovery, collection and research of China's National Historic Treasures and Cultural Relics. The Museum is home to thousands of historical objects some of whom are on display inside the large Museum. comprehensive Museum focussing on History, Art & Culture with the object of displaying Chinese History & Culture to a National as well as International Public in systematic and understandable way. A special section of the Museum is reserved for the Introduction and Display of "World Cultures" highlighting a number of the worlds great and ancient Civilizations. The National Museum together with The Palace Museum are the Most Important Centers of historical discovery, research and collection in the Chinese Nation. 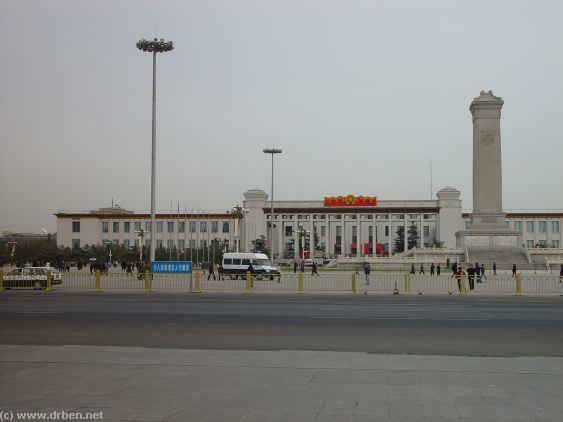 Because of its central location at Tiananmen Square, the front of the museum has been used since the 1990s for the display of countdown clocks relating to occasions of national importance. The first of these clocks was mounted above the stairs to The National Museum to display the counting down towards the transfer of sovereignty of Hong Kong from the United Kingdom to The Peoples Republic of China in 1997 AD. The second such clock counted down towards the transfer of sovereignty of Macau in 1999. 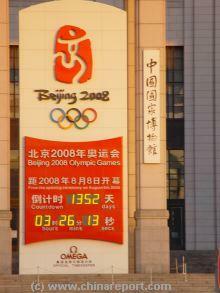 And so far the latest clock was standing in front of the museum counting down towards the start of the Beijing Olympics on 8 minutes past 8 on the morning of August 8 of 2008 AD. Opening Hours: 9:00 AM to 16:30 PM (See Below). 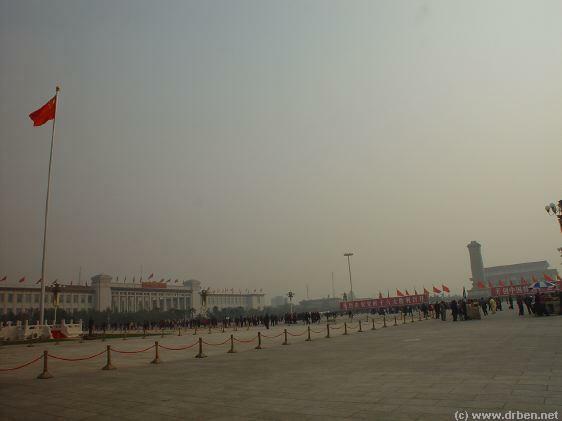 China's National Museum, the National Flag Stand and crowds at TiananMen Square. 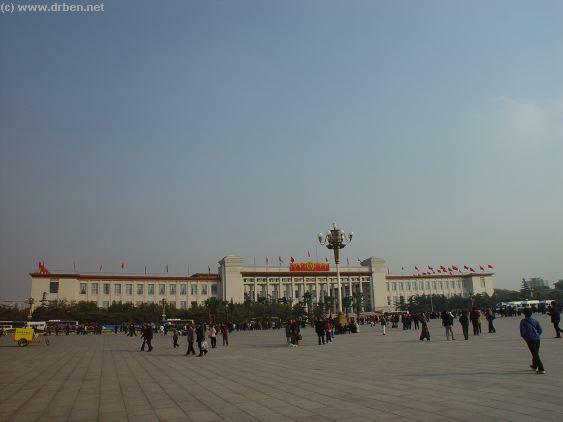 In the Distance the Monument to the Heroes of the Revolution and the Mausoleum of Chairman Mao Zedong (Photo November 2002 AD). displays of which only an approximate third were covered by English captions, the majority (seemingly) best left untranslated for Foreign Visitors, although carefully edited English language audio-guides were available. The Museum of the Revolution opened in 1960 AD and was formed from the Office of the National Museum of the Revolution, founded in 1950 AD. The Museum of the Revolution did have English explanations for all exhibits, however they were short, brief and shallow. The Museum of Chinese History contained artifacts of the entire Chinese History, from it's very origins to the current day's. The exhibits were further subdivided into the categories of early human society, slavery, feudalism, then Capitalism and Imperialism, all according to Communist Thought and Views of History. The Impressive Front of the National Museum as seen from the Square of Heavenly Peace (Photo May 2005 AD). Kai-Check and the Communist Party of China under Leadership of Mao Zedong (and Zhou Enlai etc) in the period between 1945 AD and October 1St of 1949 AD. 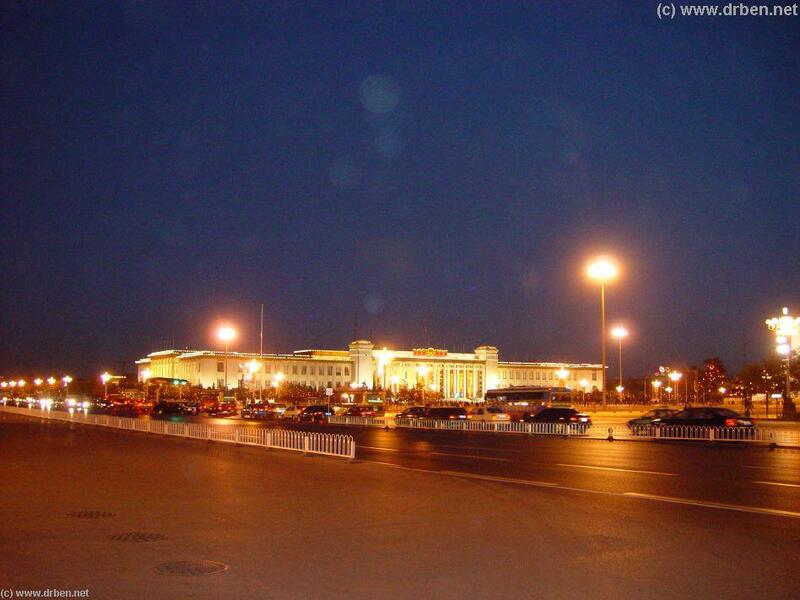 A Night View of National Museum with traffic at Beijing City Centre's main traffic artery Chang An Avenue in the forefront (Photo November 2003 AD). 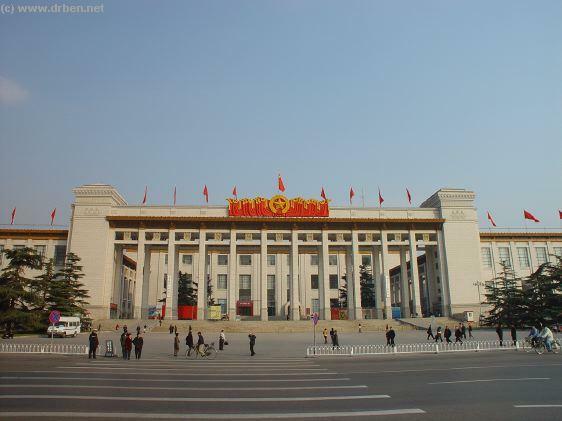 The original Museum of the Revolution has been built at TiananMen Square at the Centre of Beijing and the Political Centre of China, A fitting place for the National Museum on Chinese History and Culture. As one of TiananMen Square's 6 main monuments and landmarks The huge Building of the National Museum is richly illuminated in the evenings. The huge 1950's style building dominating the TiananMen Square's eastern flank is turned into a triumphant sea of light radiating out onto the Square. The building interacts perfectly with the other Socialist Memorials on the Square turning the entire area into an impressive propaganda piece, enshrining the achievements of the Communist Revolution which in Time gave Birth to the Modern China. The National Museum of China has a four-storied main building with two symmetrical wings, runs for 313 meters north to south along the eastern side of Tian'anmen Square, with a width of 149 Meters. Eversince the Februari 28Th of the Year 2003 the former two Museums have been jointly active as the new National Museum of China offering a brandnew set-up and historical and cultural exhibits available on a total floor space of 65,000㎡ at present (to be enlarged to 192,000㎡). The National Museum (formerly Museum of the Revolution and Chinese History) as seen from TiananMen - Gate of Heavenly Peace in the evening. Tiananmen Square monuments, including the National Museum are illuminated on weekdays until around 10 pm, and fridays and saturdays and special holidays untill 11 PM at Night. 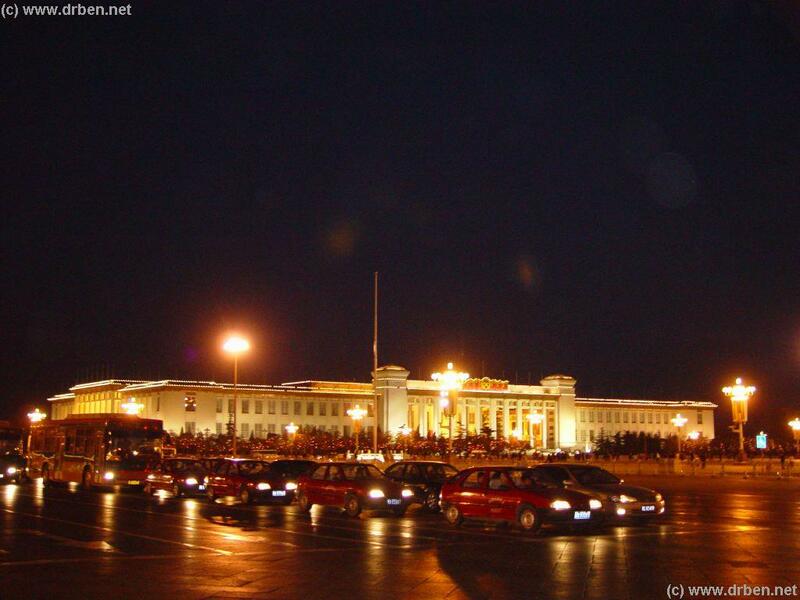 During the August 2008 Olympic Games special Festivities illuminated the Square further with A Gigantic Fire Works display. Maoism and Communism have been somewhat subdued and have been replaced by a more modern approach and view of Chinese History and Culture. The Museum obviously stresses the importance of the China Communist Party for the Birth of Modern China and further offers has a rich program highlighting different periods in Chinese historic development. The National Museum is open every day of the week and is closed only on the day before Chinese New Year. 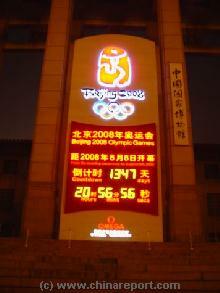 The Official 1st Beijing Olympic Countdown Clock on the steps of the National Museum some 1352 days before the Opening Event. Checkpoint opposite the National Museum in November 2005 AD. building, according to blueprint of the project. During the current construction phase the 620,000 collections and relevant facilities have been moved out of the Museum and the Museum is once again Closed. According to schedule the National Museum with new buildings is expected to be completed in the year 2009 AD, in time for the 60Th Celebration of the Birth of The peoples Republic of China.The project however has sen delays and may see a more realistic 2010 AD conclusion date. The New National Museum will cover a land space of 70,000 square meters, have exhibition floor space of 192,000 square meters and will reach 40.3 meters high. opinions and currents. Regardless of the importance of the Museum none of China's Leaders, including Chairman Mao himself, is discussed in any Detail inside the Museum. For the contract for the job of designing the new Wings to the Future Modern National Museum of China an International Competition was organized by The Beijing Municipal Government. In the End RTKL, a global architecture and engineering practice, headquartered in Baltimore, Maryland, USA won with splendid design which according to the jury "demonstrates an understanding of the historic context of the site and provides a contemporary design that complements the building’s traditional Chinese architecture". The expansions of the National Art Museum in China will connect to the east wing of the Museum through underground spaces, and will provide permanent and temporary galleries and a significant amount of public spaces, offices for social programs and significant spaces for the storage of the ever growing collections. After onclusion of this museum renovation in style, museum will cover over 2 million square feet at a total cost the equivalent of approximately $211 million Yuan (RMB). The local architect for the project is Beijing Institute of Architecture. Since Sunday July the 6Th of 2008 AD The National Museum displays a bilingual signboard. This is the first time the Chinese National Museum displayed a signboard in English. The National Museum has reopened already in July of 2008.